What's left of Frankie Pane's. 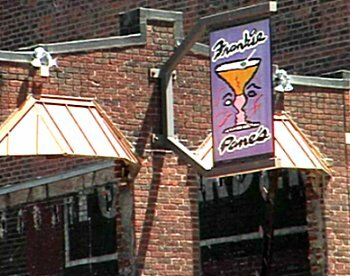 The Sad Story of Frankie Pane's. I felt really sad when I saw what was left of Frankie Pane's. 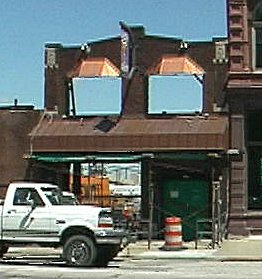 They hadn't intended to demolish this historic building, home of the original production of The Last Session-Omaha. 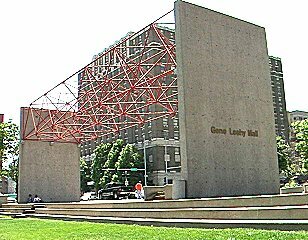 Oh, there were some corporate types who WANTED to demolish it, but the owner loved this building. He loved his club. Everyone always talked about how he was there every night, tending to every detail. Now, don't get the wrong idea. This wasn't some hoity toity black tie place. Nor was it even a theatre. 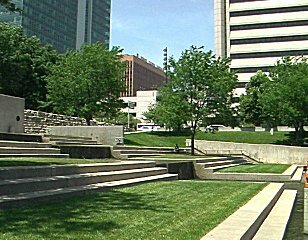 The postage stamp sized stage was almost completely unnnavigable. The light system was anything but sophisticated. The backstage was actually just outside back door, barely two persons wide (as long as they stood back to back) between two brick walls. No, the thing about Frankie Pane's, for me, was that it was the last place I spent time with Dickie. Right in front of Frankie Pane's Dickie and I used to sit on this little hill overlooking a little creek that wound its way through to the Colorado River. I didn't know, at the time, that it would be our last trip together doing AIDS awareness. Kids just loved him. Everyone loved him. He was my savior when Jimmy and I were apart and he was the one who played a huge part in convincing me that we belonged together. (I am high maintenance -- Jimmy is the only one who can actually put up with me). 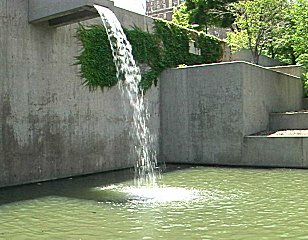 The downtown park in Omaha. 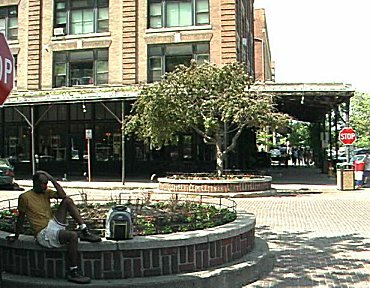 During the daytimes here, when it's not too hot, I walk past the park and over into what's called Old Market. I love this little section of town. 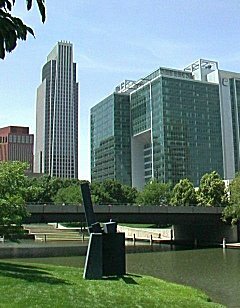 Omaha was an outpost that achieved national recognition when President Lincoln located the eastern terminus of the first transcontinental railroad (Union Pacific Railroad) in Omaha, breaking ground in December 1863. 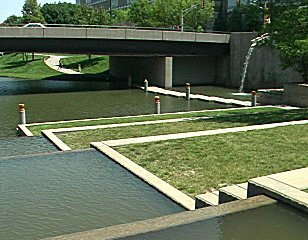 With the Missouri River (also one block away) and multiple railroad outlets, Omaha became a trading center with a huge stockyards. 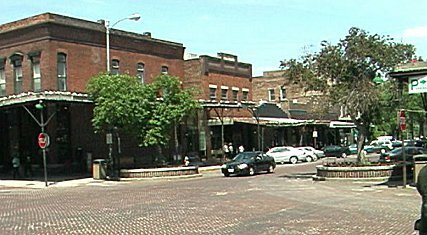 I'm assuming that the buildings in this Old Market area are from that era. 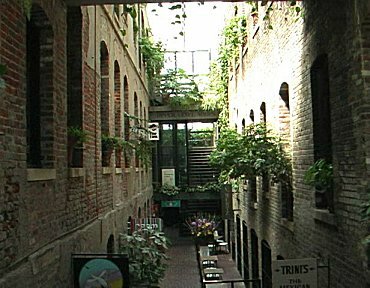 They are two and three story brick buildings with old fashioned western facades. 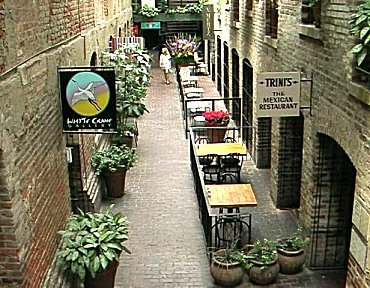 The streets are made of brick. People just come and hang out. 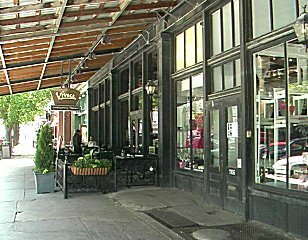 This is Vivace's, an upscale northern Italian restaurant. 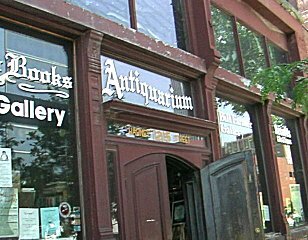 An "Antiquarium." There's a word you don't hear much anymore. 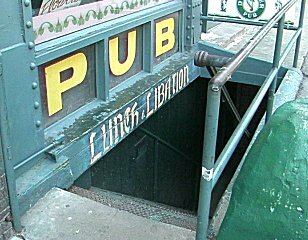 And a pub that goes down into the ground. 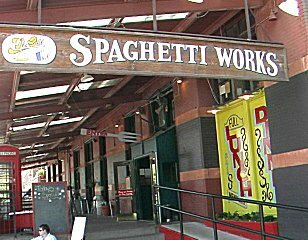 All the spaghetti you can eat. The red sauce is to die for. Our second review from the Omaha Reader, the weekly alternative, came out last week and once again it's a total rave! I know there must be a critic out there just waiiting with guns loaded to slice us up into a thousand pieces, but so far -- knock wood again -- it hasn't happened. There is also some action happening in New York. Not just one, but two opportunities are being offered to us. I will talk about it when I can, but even if they don't pan out, the thrill of knowing that others are coming to us -- rather than us having to go to them with hat in hand -- is wonderful. Comedy reigns supreme with The Big Voice: God or Merman?, a melodious, autobiographical romp, written and performed by Steve Schalchlin and Jim Brochu. Billed as “A Musical Comedy in Two Lives,” this hilarious production chronicles the experiences of two gifted gay men, both of whom had dreamed of careers in religion. Suffice it to say, these performing bombshells make magic together, harmonizing to Schalchlin’s first rate original songs in good voice, coupled with their dynamite delivery to Brochu’s hysterical book. Their performance, impeccably paced and professional to the core, radiates immediacy, never reflecting trite responses, always emitting spontaneity and control as the audience cackles and applauds for more. So, it's a bittersweet time. The sad story of Frankie Pane's destruction, the memory of my last really good days with Dickie. But on the other hand, life is about renewal. The SnapFest continues in a newer, larger facility, I continue to make new friends who I hope to hang onto forever, the promise of great things looms as people jam themselves in to see our show, and New York beckons on the horizon. We can mourn the people and things we lost, but the greatest tribute to those we loved is to pick up the pieces and thrive in the life we now have.